Though England could be the birthplace for cricket, there is no doubt that when it comes to popularity football scores quite heavily. There are thousands of followers of various local clubs and there also are thousands who have a leaning towards a particular player or a group of players. Hence, almost the entire year around the game is followed closely. 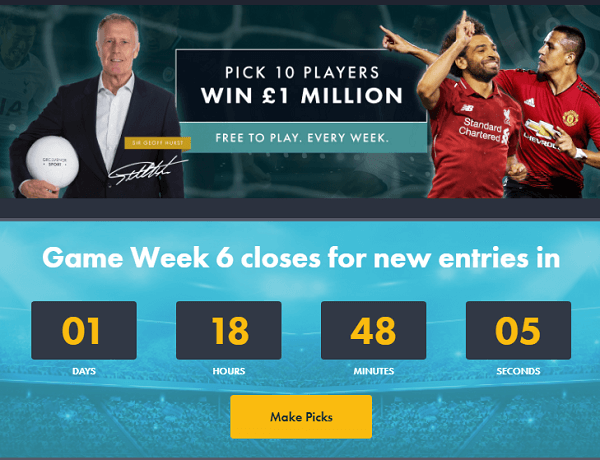 While millions watch the game for the fun of it and for their attachment to certain teams and player, gambling is also hugely prevalent as far as football is concerned. It is quite likely that there could be millions of sterling pounds which could be lost and won each year because of gambling in football. In this article, we will look at the midweek football matches and analyzes the odds of some matches which have been slated. What Are the Matches Scheduled? As far as the midweek is concerned, there are a few matches lined up, and each one has its own importance and relevance. We will try and list down the matches which have been scheduled for Monday, December 26, 2016, and Tuesday, December 27, 2016, and try and have a look at a few of them as to the expected results, the odds and what are the strong and weak points of the teams. Watford as per the latest point table standing is in the 12th place, and therefore they are the favorites for this game against Crystal Palace who is standing 17th out of 20th. Hence, it is obvious that whether it is winning for Watford, the draw of the match or loss, the Odds are heavily stacked against Crystal Palace. The odd for a win for Crystal Palace is 15/8 compared to an odd of 6/4 for a Watford win. A draw is also unlikely given the fact that the odds are 6/4. Arsenal is 4th in the league table point standings, and therefore one would expect that they start as firm favorites to win their upcoming match against West Brom. If you go out and try to get a midweek football coupon, you must keep this into account. Now coming to odds, it could vary from bookmaker to bookmaker but in general, the odds in favor of an Arsenal win is 1/3, and for a draw, the odds are 17/4 and a win for West Brom, which seems highly unlikely the odds are 8/1. Hence, the results according to many are already a foregone conclusion in favor of Arsenal. The competition between these two teams on Monday could be quite close given the fact that they are evenly poised. It is not only in terms of team strengths but in point table standings too. Middlesbrough is 14th in the points tally with Burnley being placed at 16th position Hence there is nothing much to choose between the two in terms of points. Hence, the odds are also quite close, and they stand at 15/8 for Burnley win, 20/10 for a draw and 8/5 for a win for Middlesbrough. 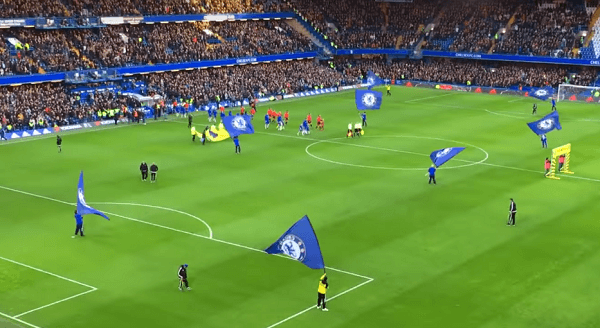 As far as the match between Chelsea versus Bournemouth is concerned, there is nothing much to predict. Being on top of the points table with great ongoing form Chelsea are huge favorites against Bournemouth, and the odds also reflect the same. They are heavily stacked in favor of Chelsea and Bournemouth being tenth in the league points table simply do not have much of a chance, to say the least. So, anybody rooting for a Bournemouth win could walk away with a big jackpot should there be an upset which again is unlikely. Everton, a potential Champion team, has not been performing true to its potential. Hence, they are lagging in 9th position in the league table. However, they are much ahead of Leicester City who is in the 15th position. Hence, it is not surprising that there is a 6/4 odd being projected by bookies for an Everton Win. This is practically a no contest as 3rd ranked Manchester United take on 18th ranked Sunderland who has only 4 wins up their belt out of 17. The match again is a foregone conclusion, and the odds are also reflective of it. The odds are 2/9 for a Man Utd Win and 12/1 for a win for Sunderland. The draw also has an odd of 11/2 which again is almost unlikely to happen. Being 19th in the points table with only 3 wins out of 17 matches, it looks like a hopeless situation for Swansea. West Ham, though not in the best of form and also not in the best of ranking (13th out of 20) still start favorites for this match. It is more of the weakness of Swansea rather than the strength of West Ham. Hence, it is not surprising to see 13/8 odds being predicted by bookmakers for a win by West Ham. It is a match of the minnows versus the potential champions. Hull who are placed at the bottom of the table virtually has no chance against Manchester City who is third with 11 wins out of 17 matches. 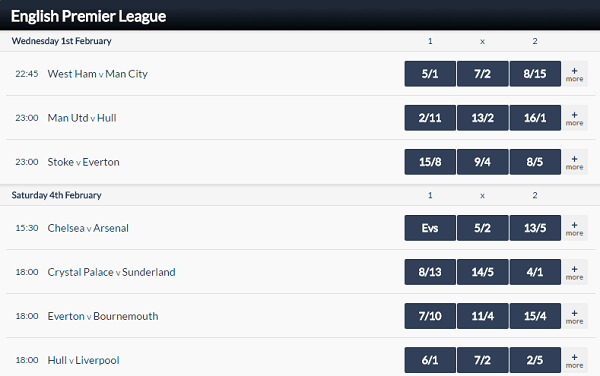 Hence, probably, it is going to be a cakewalk for Man City and 8/1 odd for a Hull win sums it all. Apart from the above matches slotted for December 26, 2016, we have one match on Dec 27, 2016, between Liverpool Vs Stoke. Being placed 2nd in the points table and having 11 wins from 17 matches, Liverpool is strong favorites amongst the bookmakers. 3/10 odds in favor of Stoke (win) says it all. Hence, when picking up the Toals midweek football coupon, the above points must be considered.